1. (Preferred) Bring your chair in for a more specific estimate. We are open Mon-Friday 10-5, and Sat 11-4. Feel free to let us know you’re on the way, or call for an appointment. 2. 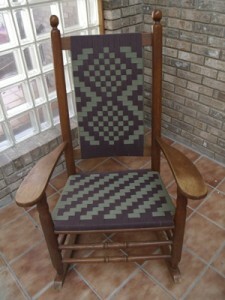 Email pictures of your chair to silverriverchairs@gmail.com for general estimates. Please show front, back, sides, & underneath and send in ONE email. 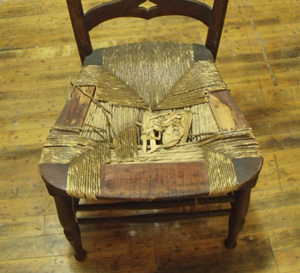 Include size of seat for machine cane, splint, rush, Shaker tape, and bark seats. 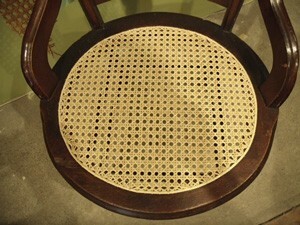 For laced cane seats, count # holes drilled into wooden seat frame and include in email. 3. Phone calls are the least efficient and least accurate way to get an estimate. We have high call volume and often have to stop tedious work to pick up the phone. We will tell you to email or bring in your chair for the best estimate. 4. See drop-down tabs below to figure out your own estimate. Prices below are general estimates and may change to reflect nuances of each chair after a close inspection in the shop. Occasionally your chair may require additional work which we won’t notice until we remove the old seat. Learn to fix your own chair! 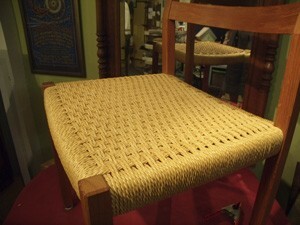 We offer classes and sell caning books for industrious folks on a budget or with multiple chairs needing repair. It is very gratifying to restore your family heirloom. See our policies & procedure page for information on additional fees that you may incur. How do I know if my chair is natural or fiber rush? Turn the chair over. Is the rush cord of uniform size and the same on the top and bottom? It’s paper rush. Often rush breaks are clean cut and do not shed grassy fibers. Cats often like to sharpen their claws on this type of chair! $150-$180 for seat repairs. See below for natural rush indicators. Generally $200 for a 17 inch chair. 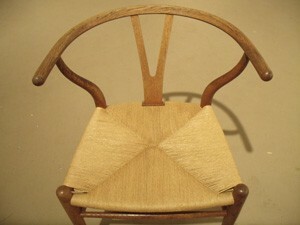 Windsor chairs have to be disassembled and reassembled to restore seat. 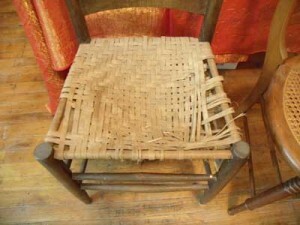 Chairs with wooden skirts that have to be removed and reattached are also more costly repairs. They are closer to $300-$400 if they have arms. 1/2-inch wide or larger reed: A basic repair of 17 inches across the front rail is about $150. Less than 1/2 inch wide reed: half the size=twice the time….$250. 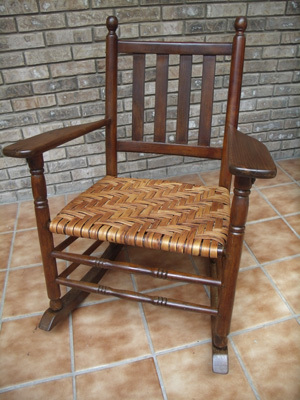 Big porch rockers: It takes about 30-40 hours to weave a porch rocker you paid $50 for back in the 70s. $300-$350 for a large rocker seat. About the same for the back. Kennedy Rocker Replacement: seats and backs are available. 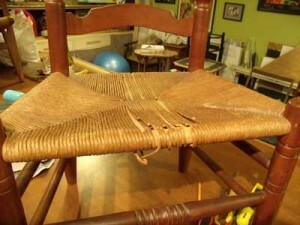 The seat is easy, the back requires sawing, cleaning out joints, knocking the whole chair apart. $400 if we do both. Priced according to job..approx $250 for small regular seat. This includes sanding and tung oil finish. The less expensive option is splint weave. Splint will be uniform in width and depth and a lighter color than bark. Note: Authentic bark is beautiful and strong and more expensive. Reed is a perfectly acceptable material for those on a budget. But we LOVE authentic bark and it comes from a 5th generation chair maker in Tennessee instead of China. 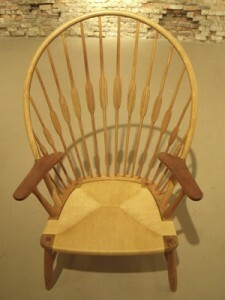 The wooden spline is the key…Imagine your chair seat or back as a picture frame with the cane as the picture. Look at the edge of the cane. 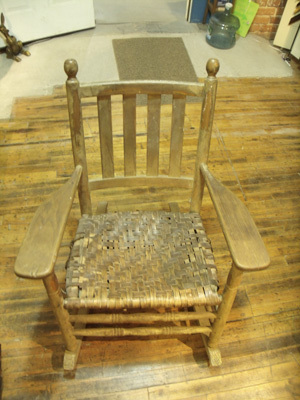 If your chair has a groove with a long slender piece of wood it is machine woven cane. An average seat can range from $80-$150. A panel on the back of the chair is generally $150. 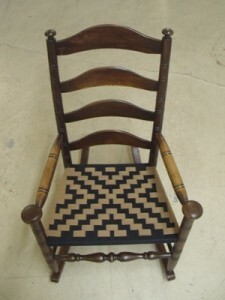 Unusual weaves/patterns/shapes will require on-site pricing. Medallion panels cost about $225-$250. These chairs take 15-40 hours to weave. We understand it is a lot of money, please understand we can’t give discounts for multiple chairs. 1. Look underneath the seat or on the back of the back. 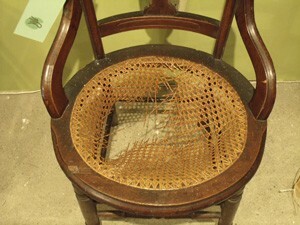 If you can see loops of cane where cane has been woven through holes drilled into the wooden frame, then you have a laced cane chair. Now look at the top of the seat/front of the back (read #2). 2. 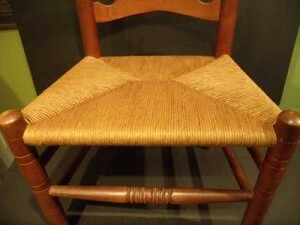 Look where the cane meets the seat on top. 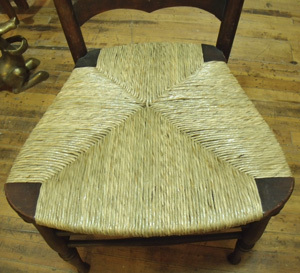 If it is a laced cane chair, there will be a wider piece of cane that has been sewn onto the seat frame with loops of cane. Curved backs like Lincoln Rockers are a more involved repair and may cost $400-$500. Often structural work is needed prior to weaving. 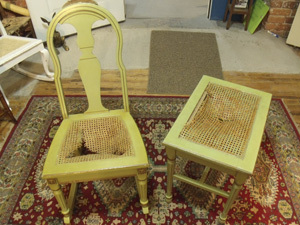 Blind Cane & French Chairs….You got a good deal on it because it needs an expensive repair. Sometimes these chairs will surprise you by ending up being an extremely complicated project that takes 6 months or more. 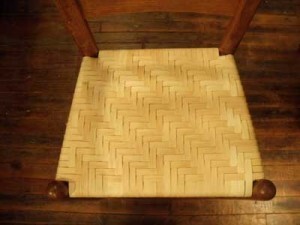 Basic Danish Cord chairs have squared seats with nails lining the perimeter of the inside underneath. Folding chairs, split rail chairs, and chairs with slots are not basic. 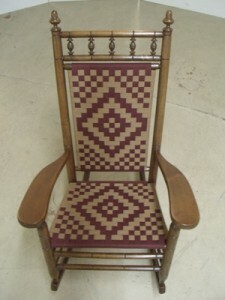 Due to the wide range of chair styles the range for repairs can vary from $250-$350. Generally you can expect $250-$275 for an average seat. Additional fee of $25 if you need new nails, most often we can re-use the nails. More involved Mid-Century Modern Chairs (you know who you are!) will require on site estimates and are charged time & materials. Danish Cord in Rush style like Wegner’s Wishbone or J-16 Rocker is in the $350 range. Danish chairs with binder cane priced on-site. 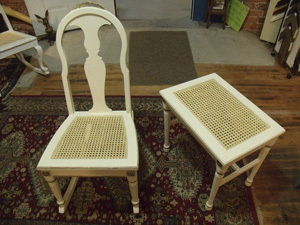 Below are some examples of Danish Cord chairs we have worked on. COLORS: We can show you examples in the studio, on line, or you can swing by Earth Guild on Patton Ave and pick out your own. If you purchase your own tape, we will deduct the cost of the material from the weaving fee. You should also buy thread to match.